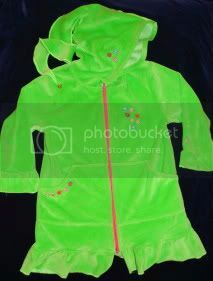 I had this gorgeous green velour and thought it would make the cutest little elf style jacket, so I altered the Farbenmix Jule pattern which is a pull over top with the cutest spiral hood. To make a jacket I split the front down the centre and added about 1.5 cm's for the zip turn over. I made the sides of the pattern more A-line as the shape of the Jule takes a lot of fabric and I was limited by the piece I had. I wanted a pocket but the Jule pattern didn't have one and I didn't like any of the other Farbenmix pockets for this jacket, so I found one in the Kwik Sew Toddlers book that I reshaped it to fit. I couldn't find a green zip in the right shade so I contemplated snaps or buttons but didn't think it would sit nicely when done up, so I used the pink zip I had and then to make the zip look like it matched I hand stitched some flower embellishments on the hood, one side of the front and the other side of the pocket. I had one lonely little flower left and it seemed a shame to throw it out so I picked a random spot on a sleeve and stitched it on there. I'm rather pleased with the end result and I really enjoyed the challenge of altering the pattern. You've done a lovely job. The flowers are an inspired touch.